User's story 2: Soil conditioner | IBE TECHNO CO.,LTD. Mr. Ichikawa operates "Kaneichi farm" in Toyokawa city, Aichi prefecture. He began to use "Super AKANE"three years ago. He uses it for preparation of the soil before planting season. After spreading "Super AKANE"he waters enough to make strong soil. He says, "It is necessary to make strong base before sowing." Mr. Ichikawa returned his home at the age of 22 after studying agriculture in a university. Since then he persisted in growing the crops like tomatoes and carrots by organic farming. He says that making soil is the same as raising human being. The key word is "balance." You can't make good soil just by increasing microorganisms. It is necessary to keep good balance chemically, physically, biologically and entirely. The soil will become soft and fluffy after spreading "Super AKANE"and water. "After treatment with "Super AKANE," soil will be good at taking nourishment and water. I think the soil needs "Super AKANE" to keep the good balance." Mr. Ichikawa uses other methods to grow his products. But he began to receive good feedback from his customers about the products after using "Super AKANE." Some say people want to eat his tomatoes. A child who did not like to eat vegetables says, "I can eat the tomatoes and carrots grown by Ichikawa." He was so glad to see a baby in diapers hugging his tomato and devouring it. He continues to produce really good taste vegetables for many people. He continues on making good soil with "Super AKANE." 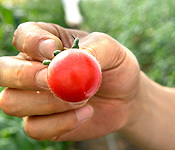 Ichikawa's tomatoes have downy hair on the surface, which is not seen for usual tomatoes. He says the hair is the proof for the good taste. A juice is made of his carrots and his friend's apples. 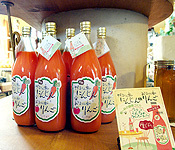 The juice is sold in a café nearby his farm and selling well. His work is based on various data to produce well-balanced soil. After using "Super AKANE," ingredient of iron in the crops are doubled and three times compared with the conventional crops.